Friends of Sutter’s Fort works every day to fund preservation and restoration efforts at Sutter’s Fort State Historic Park. The work of preserving structures that are over 100 years old is an ongoing, daily task. Friends of Sutter’s Fort is committed to helping to fund these projects. In the past four years alone, we have provided critical funding for several major preservation projects valued at over $800,000, including the painting of the exterior walls, the restoration of the blacksmith shop and the painting of the interior walls. Sutter’s Fort is home to Sacramento’s first brandy distillery. The current still on display is from the 1890s, and Friends of Sutter’s Fort is seeking funds to replace the still with an 1840s era replica. We would like to create a working still, where visitors can better understand the science behind distilling. 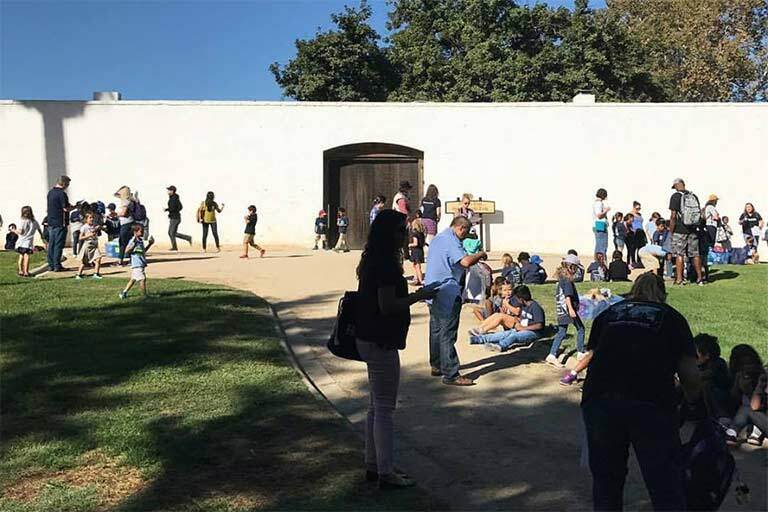 Friends of Sutter’s Fort is currently working with high school students from the greater Sacramento region to produce a new and improved orientation film. We are seeking funding to help renovate the media room to make it more comfortable for visitors, and to make the space more inviting and usable. Sutter’s Fort State Historic Park (SHP) is a historic site that has a great deal of significance to both Sacramento, California and world history and is recognized as both a California Historical Landmark and a National Historic Landmark. 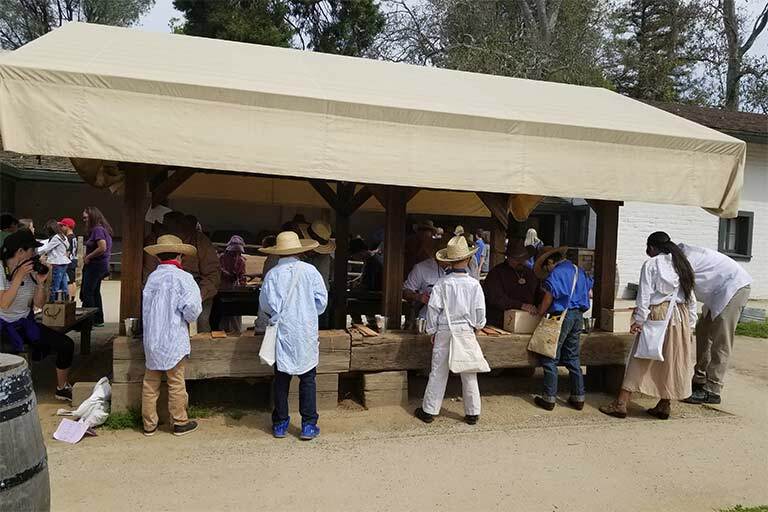 Today, people visit Sutter’s Fort from throughout the world to better understand the history that led to the famous Gold Rush, the Bear Flag Revolt and to California becoming part of the United State of America. The structures of Sutter’s Fort were the first non-Indigenous structures built in Sacramento and the site of the first non-native community in California’s Central Valley. The Central Building of Sutter’s Fort is a two-story adobe structure built between 1841 and 1843, and it the oldest existing building in Sacramento. The exterior walls of Sutter’s Fort originally extended farther out than they do today. Sutter built the original fort with walls to be 2.5 feet thick and 15 to 18 feet high. When gold was discovered in 1848, the rush of immigrants to California seeking treasures brought the downfall of Sutter’s empire, and soon the Fort walls were dismantled and all that was left was the Central Building. In 1891, the Native Sons of the Golden West spearheaded restoration efforts, rebuilding the walls of Sutter’s Fort. Completed in 1893, this restoration effort makes Sutter’s Fort the oldest restored Fort in the United States. Sutter’s Fort was donated to the State of California, and became part of the California State park System in 1947. Today, the Fort is furnished and reconstructed to reflect its 1846 appearance. In addition to the historic structures at Sutter’s Fort SHP, Friends of Sutter’s Fort also is committed the preservation of the many artifacts that are part of the Sutter’s Fort Collection. This expansive collection of artifacts is housed both at Sutter’s Fort, and at the State Museums Collections Center, which is also managed by California State Parks. Artifacts include furniture, tools and artwork, along with thousands of photographs and documents. Due to the difficulty to control the environment in the historic structures of Sutter’s Fort, many of these items are not currently accessible to the public. It is our hope to provide future funding to expand the ability to exhibit these items for public viewing. We also hope to fund efforts to preserve and protect the artifacts. In 2017, Friends of Sutter’s Fort funded this $115,000 project that restored the interior walls of Sutter’s Fort State Historic Park. Once work began , this project took over 6 months to complete. The project was a painstaking process that included repointing mortar, repairing cracks and applying fresh “breathable” paint to protect the surface for important historic preservation purposes. One of the most significant improvements that this project made was replacing the old blue-grey trim color with a historically accurate green, which was matched by California State Parks restoration specialists. In the Spring of 2017, Friends of Sutter’s Fort was able to partner with the Sacramento Pioneer Association to fund a full renovation of the Blacksmith Shop at Sutter’s Fort State Historic Park- the first renovation of the Blacksmith shop since the initial reconstruction in the 1890s. The Sacramento Pioneer Association graciously donated $26,000 for this project. The project included reworking the chimney, rehabbing the forge/firebox and updating the exhaust ducting. The windows and entrance doors were also stripped, repaired and painted, the walls were cleaned, repaired and painted and the uneven floors were leveled and resurfanced with soil cement so that it was even with the exterior pathways. While this project was underway, we also funded the cleaning and repairs of all of the Blacksmith shop artifacts and furniture. Having a skilled blacksmith at the Fort was a real point of pride for John Sutter. Blacksmith skills were in great demand to help transform dark metals into original tools and hardware to be used as shoes for horses, lance heads for soldiers, tires for wagons as well as for making door handles, hinges, latches, and much more. 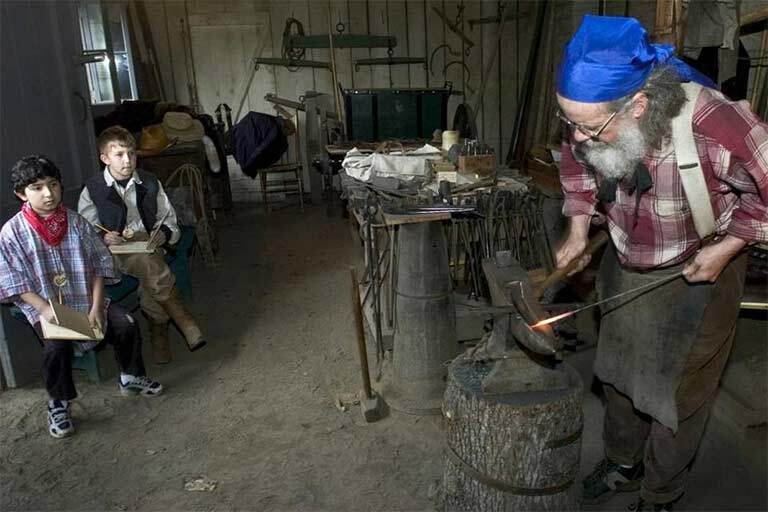 Today, Sutter’s Fort has several talented volunteer docents who interpret the Blacksmith shop, delighting visitors of all ages. In 2016 Friends of Sutter’s Fort provided funding the California State Parks to rebuild the carpenters ramada, which had been destroyed in a storm. Plans and materials were assembled and precut offsite, and then a dedicated team of volunteers and State Park staff came together to rebuild the ramada in just one day! The carpenter’s ramada is important for several reasons. First, it allows interpretation of carpentry during Hands on History and other events. Carpentry was an important aspect of life in the 1840s, and Sutter relied on carpenters to build many items at Sutter’s Fort. Carpentry of this period was a complex trade, requiring a great deal of skills and knowledge. The work of the carpenter was closely integrated with everyone’s life. Wood products, from pitchers to beds to wagons to houses, were purchased more or less directly from the carpenter. One important carpenter at Sutter’s Fort was James Wilson Marshall, who became Captain Sutter’s chief mechanic (Marshall was a Master Coachwright, Journeyman Wheelwright and Millwright.) Later, Marshall went on to become famous for his role in the discovery of gold in Coloma. The carpenters ramada is also extremely important for the educational programs at Sutter’s Fort. The carpentry station provides opportunities not only to learn about history, but also Science, Technology, Engineering and Math. Most schools who participate in the Environmental Studies or Environmental Living Programs at Sutter’s Fort SHP include a carpentry station, where students learn how to build something using period appropriate tools including hammers and nails. 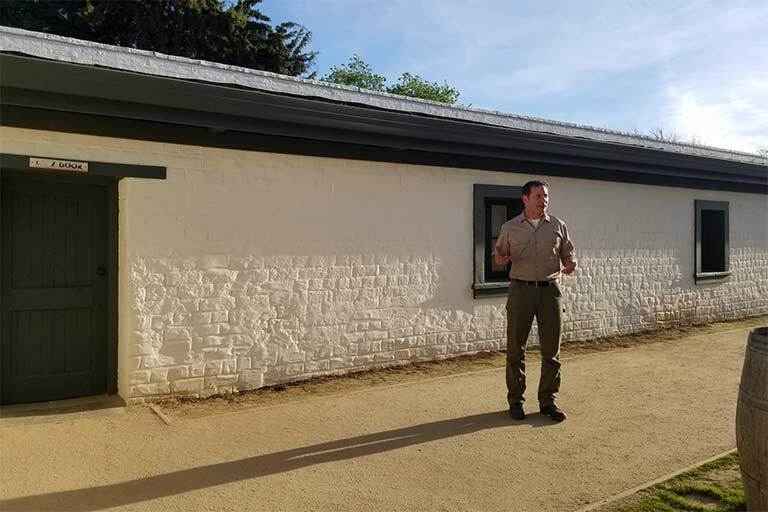 The painting and rehabilitation of the exterior walls of Sutter’s Fort was one of the largest restoration projects since it became part of the California State Park System in 1946. This project cost over $600,000 to complete, and took nearly a year to finish. The historic exterior walls of Sutter’s Fort were rebuilt for the first time in the 1890s in the first restoration project in California, undertaken by the Native Sons of the Golden West. I nthe 1950s, California State Parks resurfaced the walls after damaging vines had been removed. In 2015, Fair Oaks philanthropist Ron Leineke pledged to donate needed funds to Friends of Sutter’s Fort to restore the historic walls and gates at the Fort. His funding allowed the iconic walls of Sutter’s Fort to be resurfaced. The painstaking process included repointing mortar, repairing cracks and applying fresh “breathable” paint to protect the surface.